I use WordWeb dictionary because it is light weight, we use this offline, provides example sentences, offer pronunciation of words and of course it’s free. I prefer WordWeb software for offline work. I still use this on my PC for offline access. The problem with this dictionary is, we cannot check spelling and grammar in real time. I recently came to know about this cool service. After trying this service for few days, I can say this is one of the best extension available for checking spelling and grammar in real time on your browser. Grammarly provides browser extensions for all popular browsers like Chrome, Firefox and for safari. Just install Grammarly on your browser and activate it to start checking all type of grammar and spelling mistakes wherever you go. use built-in smart dictionary to look up word definitions with one click. Once you install and activate this service, you can use this service anywhere on the web. You just start typing on page, you will see G symbol at the right side of the window which checks spelling and grammar for you. If it catches any error with words, it will highlights the word in red underline. Just point your mouse over the word and you will get suggestion for it. Select the word that you need to replace the error word with suggested word. 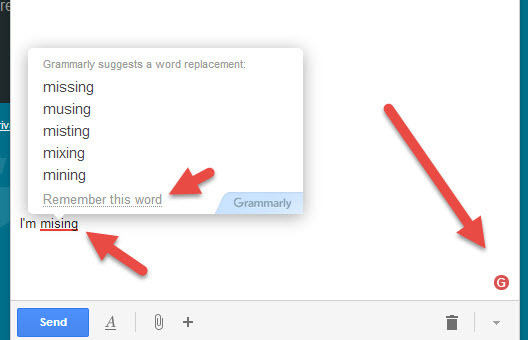 If the word is right, but still Grammarly shows error for that word, then click on Remember this word option to remember that word. It will be added that word to your personal dictionary. If you didn’t get meaning of any word, then just double click on the word and it will automatically displays the meaning of that word in the same page itself. How to Install and Activate it? 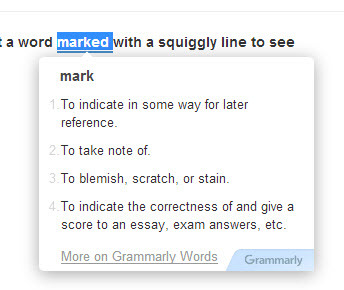 Just download the Grammarly extension or add-on for your browser and activate it. Once you activate this, you will be taken to a page where it ask your Email address. 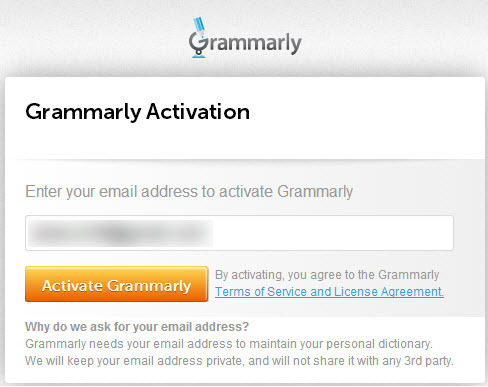 Put your email id and click Activate Grammarly button to start using this. It asks your email address to maintain your personal dictionary. I recommend you to provide your valid Email address. If you are someone who write lot of stuff online, then this is must have extension for those users. It do few more task which I have not mentioned in this post. Do try it once, I’m sure you will like it. This is one of the best way to check grammar and spelling in real time on your browser. I love this extension, and I’m using it as well. I’d like to find an extension or standalone app which lists all the squiggly-underlined words I’ve typed, so that I don’t need to keep right clicking on the individual words. That right-clicking takes time and lots of mouse movement. Have you heard of any app or extension like that? You probably know that Microsoft Word’s spellchecker will keep a dialogue box open and go from one questionably spelled word to the next. This is a lot easier for me. I guess I could copy and the web text, then paste it into Word to use the Spelling check function- but that takes too much time to do. Any ideas would be very appreciated. thanks. Got it what you are trying to say… but I’m not aware of such feature with any tools.